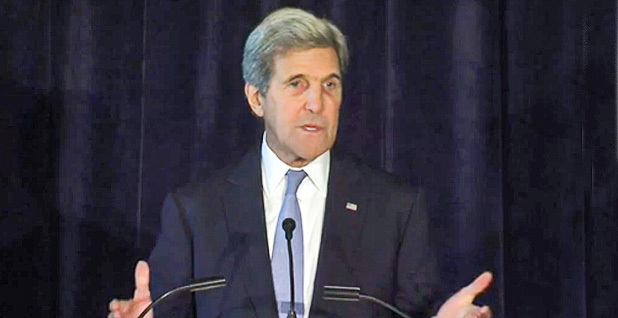 Secretary of State John Kerry at the United Nations yesterday called on countries to support an amendment to the Montreal Protocol to phase out hydrofluorocarbons. Photo courtesy of the State Department. Speaking in a posh Midtown hotel conference room blocks away from the United Nations, where the landmark global warming deal struck in the French capital sailed past its first ratification hurdle Wednesday, Secretary of State John Kerry said a hydrofluorocarbon phasedown under the Montreal Protocol would be a "huge step" toward making good on the promise of Paris. "We know that the Paris Agreement itself won't, in and of itself, get the job done," said Kerry, who spent much of that summit in the suburb of Le Bourget working to deliver the deal. "So we need to do more," he said. "And one of the single most important actions that the global community can take is to amend the Montreal Protocol to include an ambitious amendment that phases down the use of hydrofluorocarbons, HFCs." Kerry was joined onstage by foreign ministers from developed and developing countries representing the 100 nations that signed on to a declaration calling for next month's summit in Rwanda to produce an "ambitious amendment" that would freeze the production and use of HFCs "early" in poor countries, cut them in rich ones and introduce "an ambitious phasedown schedule for all parties." The statement was accompanied by pledges of a combined $80 million by 16 countries and a variety of private philanthropists aimed at helping poor countries make a swift transition away from HFCs, and by a statement of support by the coolants industry. The so-called New York Declaration of the Coalition to Secure an Ambitious HFC Amendment was signed by more than half the world's countries two weeks before negotiators gather in the Rwandan capital of Kigali with hopes of ironing out continuing areas of disagreement about how the world should phase out these climate superpollutants. HFCs are used in cooling and refrigeration and can be thousands of times more climate-forcing that carbon dioxide, though they stay in the atmosphere a shorter time. The amendment has been a long-term priority for President Obama, and securing it is perhaps the most important item still on his climate diplomacy to-do list besides seeing the Paris deal take effect. That agreement moved closer to entry into force Wednesday when a requirement that at least 55 countries join was met. Paris will take effect when countries responsible for 55 percent of greenhouse gas emissions join, which will almost certainly be later this year. So Kigali is seen as the next opportunity to make a serious impact on warming, but the road to an amendment has been long and bumpy. Countries including China, India and Arab nations have historically objected to amending the ozone treaty to address HFCs, often insisting that climate issues fell under the purview of the U.N. Framework Convention on Climate Change (UNFCCC). That opposition began to crumble when Obama and Chinese President Xi Jinping agreed to work together on an amendment during a summit at Sunnylands, Calif., in 2013. Now virtually every country in the world agrees on the need for an HFC phasedown, though they don't all see eye to eye on how it should be constructed. Speaking at yesterday's event, Chinese Ambassador Liu Xiaoming touted Xi and Obama's agreement earlier this month to collaborate on an "ambitious" HFC amendment, which came the same day the world's two largest emitters ratified Paris. But he also made a plug for the continuation of "common but differentiated responsibilities" between wealthy and poor nations — a convention of the UNFCCC that was all but sidelined during last year's carbon deal but that still holds sway under the Montreal Protocol, where developed and developing countries phase out emissions at different rates and assistance is provided to poor nations. And while he made a pitch for developing countries to "have their needs met," Liu pledged that China would "continue to work with all other parties toward an ambitious and comprehensive HFC amendment to the Montreal Protocol this year." Negotiators and advocates who follow the HFC debate say they are optimistic that next month's summit will produce the looked-for amendment, which they hope will help save the world a half-degree Celsius in warming by the close of this century. The long-term goal was to contain postindustrial warming to well below 2 degrees, which would make the Montreal Protocol amendment a hefty down payment on Paris. But there are still many questions to be settled as the days count down to Kigali. These divide generally into questions about how ambitious the deal will be and about the resources that will be available to poor countries to help them transition to less climate-forcing coolants. The ambition of any amendment will be determined by how quickly poor countries' emissions are capped, how quickly rich nations cut their emissions and ultimately when the chemicals are phased down completely. Also important is the baseline that is used to measure those reductions — the higher the baseline, the more leeway a nation has to keep producing and using HFCs. During a preliminary meeting in Vienna in July, there were eight proposals, though negotiators say some of those differences have narrowed since and predict that parties will eventually coalesce around a common model in Kigali. The world's developed countries proposed that developing nations begin cutting their emissions in 2019 from a baseline average of 2011 to 2013 levels. But China, Argentina and the Persian Gulf states put forward slightly different models that capped HFC growth in the middle of the next decade, while India held fast to a freeze date of 2031. Poor countries note that they are responsible for emitting far less HFCs than developed nations. They also are still gaining access to refrigeration and air conditioning, making it harder to stem HFC growth. Advocates, meanwhile, argue that the rapid proliferation of air conditioning in the developing world is exactly why an early freeze date is important. Observers say China and Argentina — both signatories to yesterday's New York Declaration — have shown considerable flexibility in negotiations since Vienna. Argentina Foreign Minister Susana Malcorra, who is also a top-tier contender for U.N. secretary-general, said at yesterday's event that while developing countries' needs for time and support must be addressed, the work of phasing down HFCs belongs to everyone. "I am convinced that we will be able to sort this out, and as proud as I was yesterday when my president presented to the secretary-general our confirmation of joining the Paris Agreement, I'm sure we will be proud to in Kigali share this common and shared responsibility," she said. India has shown little movement coming out of Vienna and is not a party to the declaration. But a senior State Department official said that is likely a negotiating tactic. Progress was made during a work session earlier this week in Beijing, and there may be more progress in the days leading up to the summit in Rwanda. Developing countries have also expressed concern about the cost of transitioning to non-HFC coolants, particularly as some of those alternatives are still under patent. The State Department source said the issues of ambition and finance are "linked" for developing countries, which might have more confidence in embracing an earlier phasedown if resources are assured. Sixteen developed countries including the United States responded yesterday with a combined $27 million pledge toward the Montreal Protocol Multilateral Fund to help poor nations transition away from HFCs and improve energy efficiency. Nineteen private donors, including Microsoft founder Bill Gates and billionaire financier Tom Steyer, supplemented that with $52 million for efficiency. The money is contingent on an "ambitious" agreement. The public-sector resources would only be provided for action taken next year, and are earmarked to help poor countries comply with an amendment with "a sufficient early freeze date," to be adopted this year. The protagonists of Paris implementation say a Montreal Protocol amendment is crucial to the success of last year's deal. HFCs drive so much warming in the short term that taking them out of the atmosphere will have a near-immediate benefit, they say, buying time for the more comprehensive agreement to go into effect. "This is the fastest way to cool the Earth, you know? And the most easy one," Morocco's environment ambassador, Hakima El Haite, told ClimateWire. In New York to represent the upcoming Moroccan presidency of the next round of UNFCCC talks, El Haite recalled how fraught the negotiations in Paris were over where to set the long-term temperature target to guide future ambition. "We made many, many, many nights to discuss and to struggle against other parties to say in the Paris Agreement one word — 'well below 2 degrees C,'" she said. "That was a struggle." But if curbing HFCs can contribute half a degree's worth of warming avoidance, she said, "we don't need to struggle." U.N. climate chief Patricia Espinosa wrote in an op-ed published earlier this month by Project Syndicate that Paris' long-term targets would eventually demand a universal HFC phasedown. "Ultimately, all countries will have to find a way forward on reducing HFCs and climate change generally, through national action plans and emissions reductions agreed to under the 2015 Paris agreement," she wrote in the column, co-authored by Nobel Prize-winning chemist Mario Molina. "Frameworks established by sister agreements like the Montreal Protocol can help to do this." Durwood Zaelke of the Institute for Governance & Sustainable Development said that because manufacturers improve efficiency at the same time as they transition from HFCs, the true benefit of an amendment could be to avoid a full degree of warming, rather than a half. The efficiency gains would save consumers money, further offsetting the cost of transitioning to less climate-forcing sources, he said. Zaelke, who follows these negotiations closely, said India's apparent opposition will not prove a significant stumbling block to hopes of securing a deal in Kigali. "There's a tremendous amount of bilateral initiative going on around the world, and India is the No. 1 country that this broad coalition for an ambitious amendment know they have to deal with," he said. The July session in Vienna showed enough progress from all players that an amendment should be possible next month, he said. But participants in yesterday's HFC events in New York said if Kigali fails to deliver, it will deal a blow to international confidence since Paris. "Kigali gives us an opportunity to demonstrate action on Paris," said Vidar Helgesen, minister of climate and the environment for Norway, which was one of the donor countries. "Just imagine if we're not successful in Kigali. What signal would that send about Paris? It would be disastrous. So we know our responsibilities." Kate Hampton, CEO of the Children's Investment Fund Foundation, which contributed to the private-sector fund, said donors were buoyed by the success of Paris and the sense that governments are committed to a low-carbon transition. "If Kigali is in some sense a failure, there will be a massive retreat of interest and capital," she said at a briefing at U.N. headquarters. She said a consistent government message would encourage private donors to offer help with other aspects of climate response. "Politicians particularly have a real opportunity here to send a very, very strong signal that this transition is inevitable, and that will mobilize resources that you can't imagine," she said. Vincent Biruta, the Rwandan environment minister, who is preparing to host next month's summit, noted that Africa stands to suffer more from climate change than most continents. All 54 African countries signed yesterday's declaration, and Africa and small island states have pushed for tougher reductions for developed countries than the developed world has proposed for itself. "We cannot afford to fail," he said.